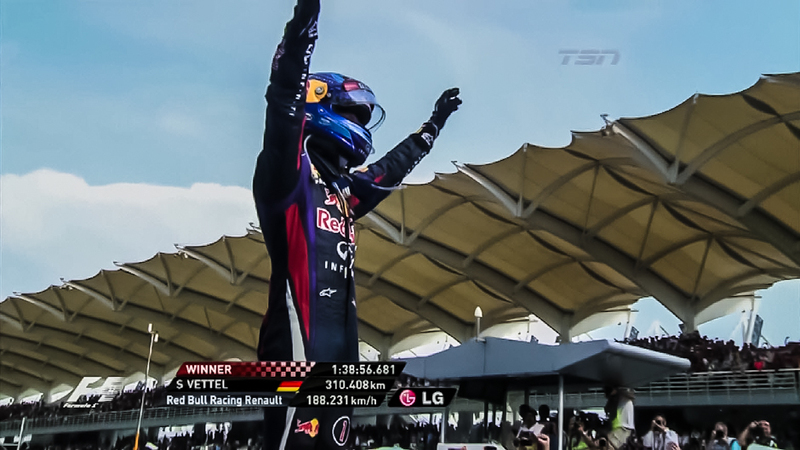 A stunning race unfolded today at the 2013 Malaysian Grand Prix, as mixed conditions gave the drivers a chance to show why they’re the best in the world. The race started out in wet conditions, with all drivers on intermediate tires. 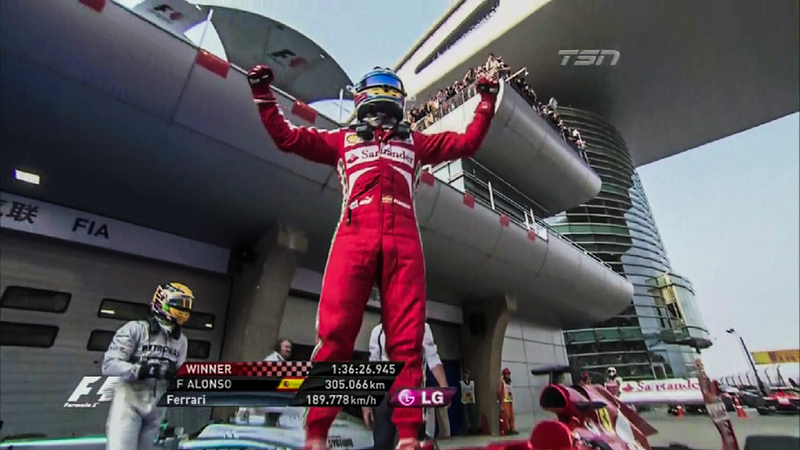 At the start, Alonso clipped Vettel’s rear wheels and breaks his front wing. 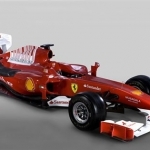 In a lapse of judgment, he decides against entering the pits at the end of the lap to replace the wing, and on the front straight, the aerodynamic load breaks the front wing and forces the Ferrari driver to retire. Kimi Raikkonen, the winner of the Australian Grand Prix last week, was forced to start 10th due to a blocking penalty in qualifying, drops down to 12th place by lap 5 as he goes off struggling with his car’s balance. As the track dries, race leader Vettel was the first to make his pitstop onto dry tires, followed by the Ferrari of Felipe Massa. As his tires get up to temp, he’s overcome by all the intermediate drivers coming out of the pit and drops to 9th. Force India pits the next lap, and Sutil had a problem with his stop. Unfortunately for the team, they double stacked both cars, causing a huge loss of time for both drivers. By lap 7, the rest of the drivers starts filing in to switch to the slicks. Lewis Hamilton seems to have forgotten that he drives for Mercedes now, and stops in the McLaren garage. A funny mistake for the 2008 world champion. Lap 9, the front of the field has changed around, Webber leading, Vettel 2nd, and Hamilton 3rd. As the track dries, the Mercedes duo of Hamilton and Rosberg in 3rd and 4th, begins to lap a second a lap faster than leading Red Bulls, closing up the gap to the leaders and into the DRS zone. Kimi Raikkonen, stuck behind the McLaren of Perez since the pit stop onto slicks, finally makes the pass on lap 16 and starts putting down one fastest lap after another, showing the true pace of the Lotus in dry conditions. On the next set of pit stops, the Red Bull cars decide to change the tire strategy, as Vettel switches to the Hards, and Webber switches to the Mediums. The Mercedes seems to be working really well in these conditions, as Hamilton and Rosberg starts laying down the fastest sectors and laps as soon as they’re out of the pits. Webber begins to suffer on his tire choice in the lead, and as Vettel catches up, holds him up allowing the 2 Mercedes to catch up. 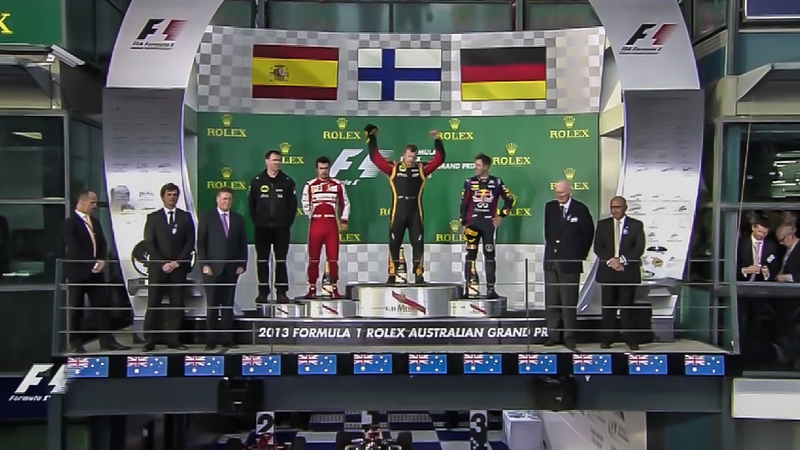 Vettel isn’t very happy with this, and complains on the radio hoping the team would force Webber to pull aside for him. 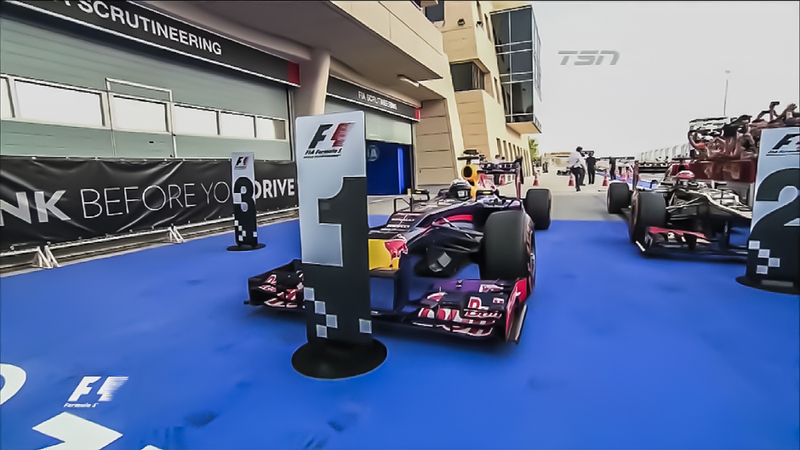 At this stage, 4 seconds separate the top 4 positions, held by the Red Bulls and the Mercedes. Lewis Hamilton, stuck behind the Red Bulls, decides to change his strategy up on lap 31 by pitting early. At this stage, the Medium tires are faster, but with a limit of how many sets of tires each driver gets over the weekend, the teams are running out and forced to run the hard tires. Once again, he begins to set the fastest sectors as soon as he’s out of the pits. Webber and Rosberg pits in next, with Vettel the lap after, behind Lewis Hamilton who put down the fastest lap of the race. This leaves Jenson Button leading the race, but he suffers problems as he enters the pit a few laps later, as the pit crew did not secure his front wheel properly. Once corrected, Button was dropped down all the way to 14th place. A pity, as the McLaren was showing excellent pace against the leaders. Two thirds into the race, Webber’s pace starts to pick up and starts to pull a second a lap on the rest of the frontrunners. Clearly, the Mercedes are not happy on the hard tires, as Vettel easily passes Hamilton to put himself back into 2nd place. Hamilton continues to struggle, now under pressure from his teammate. The Red Bulls begin to pull away from the Mercedes duo at a rate of a second a lap. Hamilton reacts by pitting on lap 42, to put himself back on the preferable Medium tires on his final stop of the race. 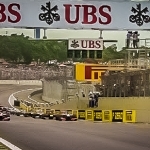 Vettel covers Hamilton by pitting on the next lap with Rosberg, while Webber makes his stop from the lead the lap after right into the path of his teammate. A fierce battle for 4 corners, but Webber holds his ground, and retains the lead. 2 laps later, another huge battle between the 2 leading teammates, as Webber forces Vettel to the pit wall, they bump into each other through turns 1 and 2. Vettel makes the pass stick by forcing Webber off his line 2 corners later. Red Bull, obviously not happy with Vettel’s dangerous move, scolds Vettel over the radio. Behind the Red Bulls, Hamilton and Rosberg battle for 3rd, as they trade places in the DRS zones. Ross Brawn, seeing how close Red Bull came to taking themselves out of the race, calls to the drivers to hold their position as Hamilton needed to run in fuel conservation mode. Rosberg is not happy at all with the decision, asking the team to let him pass, but was denied by the team on the pit wall as the race draws to a close. An exciting race, even though the Red Bulls once again makes their strategy work for another 1-2 finish. Next race is in China in 3 weeks, we’ll see if the teams have figured out these 2013 Pirellis, or if we’re going to see another topsy turvy race.